Maruyama Ōkyo was the most influential painter and teacher of his time in Kyoto. His mastery of brush and ink found expression in a variety of Chinese and Japanese subjects, painting styles, and formats. 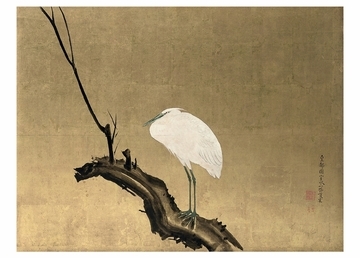 This depiction of a heron on a willow tree branch is done in a classical Japanese painting (yamato-e) style, utilizing flat areas of colorful pigments set against an expansive background with little or no spatial depth.